Home/News/Steelers extend win streak to 6! That’s what I’m talking about! Fight! – Cam, on the come-from-behind win. The Steelers kept their win streak alive with the win in Jacksonville. Watch highlights from the win! Hargrave had four tackles, plus two of the Steelers’ six sacks, and during the Steelers’ frantic comeback in the fourth quarter he batted down a pass on a third-and-11 to get the defense off the ball and the ball back to the offense. Hargrave is the Steelers Digest Player of the Week. 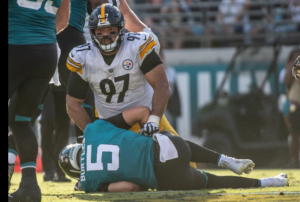 #Steelers DT Cameron Heyward (@CamHeyward) brought down Jacksonville QB Blake Bortles for a sack (minus 7 yards) in the fourth quarter, increasing his 2018 sack total to 5.5 and career number to 42.5. He has recorded at least one sack in back-to-back games (2.0 vs. Carolina).